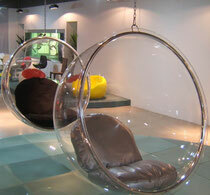 Bubble chair was designed by Eero Aarnio in 1968 in Finland. It is made of acrylic or steel frame and leather or polyurethane fabric cushions. It is distributed by Adelta. The chair is suspended from above leading to a floating or bubble-like sensation. It is considered an industrial design classic and advanced the usage of plastics in furniture design. The chair is considered modernist or spaceage and is often used to symbolise the 1960s period.